Our Tambourine collection will keep you jumping, twirling and singing all spring! Includes: Professional recordings and downloads, a newly designed fullcolor illustrated songbook, membership to our online Family Music Zone with games and activities for your family, access to the award-winning "Hello Everybody" App, our Parent Education booklet, and a dedicated teacher who trains regularly to give you the best experience possible. 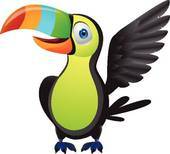 Welcome to our Toucan collection, in which your child will be learning to drum, sing, move to new rhythms, work in ensembles, conduct, improvise, and play dynamic music games! We will explore rhythms inspired by Samba and South America in this peppy, energized collection of music. If your child (Kindergarten and older) has not tried this class, sign up for a demo. Your child will thank you! Includes: Professional recordings and downloads, online instructional drumming videos with Rhythm Kids creator Tom Foote, a Songbook with music and activities, membership to our online Family Music Zone with games and activities, and access to the award-winning "Hello Everybody" App, and our Parent Education booklet. Spring 2019 Music Together registration is OPEN. See class schedule below. Tuition: $199 for first child, $135 for second child, $85 for third and others. Sibling rates apply for multiple classes. Siblings under 7 months are free but must be registered for space considerations.